Symbol of the rebirth of the area after the earthquake of'97, bears the signature of architect Massimiliano Fuksas the new sacred monument inaugurated in Roccolo streer at Foligno in the spring of 2009 and wanted by the Italian Episcopal Conference. The Church of San Paolo that doesn't leave indifferent the visitors to the particularity of its architecture, for the connotations of its modern style, for its innovativeness. The structure comes from a combination of two parallelepipeds that are joined together to form a single cube. The two volumes are one inside the other. 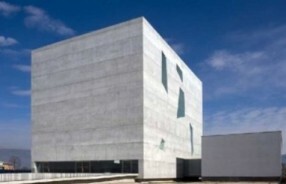 A parallelepiped outside off large 22.50, long 30 and high 26 meters, made of reinforced concrete on demand and an internal, suspended 3 meters above ground and walls of the external volume, this made of lightweight steel and cement. To complement the functions then realized it was third parallelepiped positioned next to the central body of the church. The light enters from above to illuminate the entire space and the center, where is located the altar, with three horizontal windows. The light is active interpreter and protagonist of the movement, as well as obvious universal symbol of sacredness. You enter in the church through the ramp and sloping churchyard, on a meter and a half by road and throught not a portal but a glass wall, which cuts horizontally across the building. For the achievement of the architect was inspired by the vertical design of the church, in keeping with the liturgical celebration of the Mass and the intention was to redefine the concept of a link between heaven and earth through the momentum upward.